The International Solidarity Movement (ISM) is a "Palestinian-led movement" focused on assisting the Palestinian cause in the Israeli–Palestinian conflict. ISM is dedicated to the use of nonviolent protests and methods only. The organization calls on civilians from around the world to participate in acts of nonviolent protests against the Israeli military in the West Bank and the Gaza Strip. The armored bulldozer is a basic tool of combat engineering. These combat engineering vehicles combine the earth moving capabilities of the bulldozer with armor which protects the vehicle and its operator in or near combat. Most are civilian bulldozers modified by addition of vehicle armor/military equipment, but some are tanks stripped of armament and fitted with a dozer blade. Some tanks have bulldozer blades while retaining their armament, but this does not make them armored bulldozers as such, because combat remains the primary role — earth moving is a secondary task. Collective punishment is a form of retaliation whereby a suspected perpetrator's family members, friends, acquaintances, sect, neighbors or entire ethnic group is targeted. The punished group may often have no direct association with the other individuals or groups, or direct control over their actions. In times of war and armed conflict, collective punishment has resulted in atrocities, and is a violation of the laws of war and the Geneva Conventions. Historically, occupying powers have used collective punishment to retaliate against and deter attacks on their forces by Resistance movements. Human Rights Watch (HRW) is an international non-governmental organization, headquartered in New York City, that conducts research and advocacy on human rights. The group pressures some governments, policy makers and human rights abusers to denounce abuse and respect human rights, and the group often works on behalf of refugees, children, migrants and political prisoners. B'Tselem is a Jerusalem-based non-profit organization whose stated goals are to document human rights violations in the Israeli-occupied territories, combat denial of the existence of such violations, and help to create a human rights culture in Israel. Its executive director is Hagai El-Ad. B'Tselem also maintains a presence in Washington, D.C., known as B'Tselem USA. B'Tselem has provoked sharp reactions within Israel, ranging from harsh criticism to strong praise. In 2005, Corrie's parents filed a civil lawsuit against the state of Israel. The lawsuit charged Israel with not conducting a full and credible investigation into the case and with responsibility for her death,  contending that she had either been intentionally killed or that the soldiers had acted with reckless neglect. They sued for a symbolic one US dollar in damages. Rachel Corrie sent a series of emails to her mother while she was in Gaza, four of which were later published by The Guardian . In January 2008, Norton published a book titled Let Me Stand Alone by Corrie, which included the e-mails along with some of her other writings. Yale Professor David Bromwich said that Corrie left "letters of great interest". The play My Name is Rachel Corrie  and the cantata The Skies are Weeping were based on Corrie's letters. Prime Minister of Israel Ariel Sharon promised President Bush a "thorough, credible, and transparent investigation". Later, Capt. Jacob Dallal, a spokesman for the Israeli army, called Corrie's death a "regrettable accident" and said that she and the other ISM activists were "a group of protesters who were acting very irresponsibly, putting everyone in danger—the Palestinians, themselves and our forces—by intentionally placing themselves in a combat zone". The army was searching for explosives in the border zone when Corrie was "struck as she stood behind a mound of earth that was created by an engineering vehicle operating in the area and she was hidden from the view of the vehicle's operator who continued with his work. Corrie was struck by dirt and a slab of concrete resulting in her death.... The finding of the operational investigations shows that Rachel Corrie was not run over by an engineering vehicle but rather was struck by a hard object, most probably a slab of concrete which was moved or slid down while the mound of earth which she was standing behind was moved. The driver at no point saw or heard Corrie. She was standing behind debris which obstructed the view of the driver and the driver had a very limited field of vision due to the protective cage he was working in.... The driver and his commanders were interrogated extensively over a long period of time with the use of polygraph tests and video evidence. They had no knowledge that she was standing in the path of the tractor. An autopsy of Corrie's body revealed that the cause of death was from falling debris and not from the tractor physically rolling over her. It was a tragic accident that never should have happened. A spokesman for the IDF told the Guardian that, while it did not accept responsibility for Corrie's death, it intended to change its operational procedures to avoid similar incidents in the future. The level of command of similar operations would be raised, said the spokesman, and civilians in the area would be dispersed or arrested before operations began. Observers will be deployed and CCTV cameras will be installed on the bulldozers to compensate for blind spots, which may have contributed to Corrie's death. Corrie's death sparked controversy and led to international media coverage. The court ruled against Corrie's family on August 28, 2012. In a 62-page verdict, Judge Oded Gershon ruled that Corrie's death was an accident for which she was responsible, and absolved the IDF of any wrongdoing. The judge ruled that the bulldozer driver and his commander had a very limited field of vision and could not possibly have seen her. According to the judge "The mission of the IDF force on the day of the incident was solely to clear the ground.... The mission did not include, in any way, the demolition of homes." The court invoked the principle of the combatant activities exception, as the IDF was attacked in the same area where Corrie was killed a few hours earlier; that Corrie could have avoided the danger and that defendants were not at fault as there was neither intent nor negligence involved in her death. The judge said that the IDF did not violate Corrie's right to life because Corrie had placed herself in a dangerous situation, that Israel's investigation was appropriate and did not contain mistakes, and also criticized the U.S. government for failing to send a diplomatic representative to observe Corrie's autopsy. Gershon said: "I rule unequivocally that the claim that the deceased was intentionally hit by the bulldozer is totally baseless. This was an extremely unfortunate accident. I reached the conclusion that there was no negligence on the part of the bulldozer driver. I reject the suit. There is no justification to demand the state pay any damages. She [Corrie] did not distance herself from the area, as any thinking person would have done. She consciously put herself in harm's way." While rejecting the Corrie family's claims to damages, the judge also waived the Corrie family's court costs. My Name Is Rachel Corrie at Playhouse Theatre, London, 2006. Iain Hook – British UNRWA project manager shot and killed by IDF during a battle in Jenin, November 22, 2002. James Miller – British film-maker shot and killed by the IDF in Gaza, May 2, 2003. Vittorio Arrigoni – Italian ISM volunteer abducted and murdered in Gaza by a Salafist militant group. Kayla Mueller – American activist and aid worker abducted by ISIS and later killed. Pippa Bacca - Italian peace activist raped and murdered in Turkey. The 84th "Givati" Brigade is an Israel Defense Forces infantry brigade, and serves as its amphibious force. Givati soldiers are designated by purple berets. The Brigade's symbol is the fox, alluding to Shualei Shimshon, a unit in the 1948 Arab–Israeli War. Thomas "Tom" Hurndall was a British photography student, a volunteer for the International Solidarity Movement (ISM), and an activist against the Israeli occupation of the Palestinian territories. On 11 April 2003, he was shot in the head in the Gaza Strip by the Israel Defense Forces (IDF) sniper, Taysir Hayb. Hurndall was left in a coma and died nine months later. The Popular Resistance Committees (PRC) is a coalition of a number of armed Palestinian groups opposed to what they regard as the conciliatory approach of the Palestinian Authority and Fatah towards Israel. The PRC is especially active in the Gaza Strip, through its military wing, the Al-Nasser Salah al-Deen Brigades. The PRC has planned and executed a number of varied operations, but specializes in planting roadside bombs and vehicle explosive charges - directed against military and civilian convoys. The Murder of the Hatuel family was a shooting attack on May 2, 2004, in which Palestinian militants killed Tali Hatuel, a Jewish settler, who was eight months pregnant, and her four daughters, aged two to eleven. The attack took place near the Kissufim Crossing near their home in Gush Katif bloc of Israeli settlements in the Gaza Strip during the Second Intifada. After shooting at the vehicle in which Hatuel was driving with her daughters, witnesses said the militants approached the vehicle and shot the occupants repeatedly at close range. Operation Rainbow was an Israel Defense Forces (IDF) military operation in the southern Gaza Strip from 12–24 May 2004, involving an invasion and siege of Rafah. The operation was started after the deaths of eleven Israeli soldiers in two Palestinian attacks, in which M113 armored vehicles were attacked. The Israeli Armored CAT D9—nicknamed Doobi —is a Caterpillar D9 armored bulldozer that was modified by the Israel Defense Forces, Israeli Military Industries and Israel Aerospace Industries to increase the survivability of the bulldozer in hostile environments and enable it to withstand heavy attacks, thus making it suitable for military combat engineering use. The IDF Caterpillar D9 is operated by the Israel Defense Forces (IDF) Combat Engineering Corps for combat engineering and counter-terrorism operations. James Henry Dominic Miller was a Welsh cameraman, producer, and director, and recipient of numerous awards, including five Emmy Awards. He was killed by a soldier from the Israel Defense Forces (IDF). The Israeli Combat Engineering Corps is the combat engineering forces of the Israel Defense Forces. Operation "Days of Penitence", otherwise known as Operation "Days of Repentance" was the name used by Israel to describe an Israel Defense Forces invasion of the northern Gaza Strip conducted between 29 September and 16 October 2004. About 130 Palestinians, and 1 Israeli were killed. My Name Is Rachel Corrie is a play based on the diaries and emails of activist Rachel Corrie, who was killed by an Israeli soldier when she was aged 23. It was jointly edited by journalist Katharine Viner and actor Alan Rickman who also directed it. The Skies are Weeping is a cantata by composer Philip Munger. The cantata memorializes Rachel Corrie and Tom Hurndall. Rachel is a 2009 documentary film by Simone Bitton detailing the death of Rachel Corrie. Rachel was an American peace activist, killed by an Israeli military bulldozer in 2003 during a nonviolent action against the demolition of Palenstinians homes in Rafah, Gaza. MV Rachel Corrie is a 499 GT coaster owned and operated by the Free Gaza Movement. The ship is named in honour of Rachel Corrie, a deceased member of the International Solidarity Movement. Built by J.J. Sietas in Hamburg in 1967, she was originally named Carsten; she has also carried the names Norasia Attika, Manya and more recently Linda. Greta K. Berlin is an American pro-Palestinian activist. She has been a spokesperson for the Free Gaza Movement (FGM), which she co-founded in 2006. Events in the year 2003 in Israel. On Sunday, April 18, 2010, the American Friends Service Committee (AFSC) initiated an event titled "The Chicago Hearing: Does U.S. Policy on Israel and Palestine Uphold Our Values? ", modeled after a meeting of a United States Congressional fact-finding committee. Events in the year 2003 in the Palestinian territories. The Gaza–Egypt border is the 12 kilometres (7.5 mi) long border between the Gaza Strip and Egypt. There is a buffer zone along the border, called the Philadelphi Route, which is about 14 kilometres (8.7 mi) long. 1 2 3 "American peace activist killed by army bulldozer in Rafah". Haaretz. March 17, 2003. Retrieved May 8, 2008. 1 2 3 4 5 6 7 8 "Profile: Rachel Corrie". BBC News. August 28, 2012. Retrieved September 13, 2012. ↑ Sherwood, Harriet (August 28, 2012). "Rachel Corrie's death was an accident, Israeli judge rules". The Guardian. Retrieved September 8, 2012. 1 2 3 4 5 6 7 "Court dismisses damages claim in Rachel Corrie case". The Times of Israel. August 28, 2012. Retrieved September 16, 2012. ↑ "Rachel Corrie: a memory that refuses to die". The Guardian. August 28, 2012. Retrieved September 7, 2012. 1 2 Gordon, Neve (September 5, 2012). "No justice for Rachel Corrie". Opinion. Al Jazeera. Retrieved September 13, 2012. ↑ Abu Hussein, Hussein (September 2, 2012). "Rachel Corrie: Blaming the victim". Opinion. Haaretz. Retrieved July 11, 2014. ↑ "Rachel Corrie verdict highlights impunity for Israeli military". Amnesty USA. August 28, 2012. Retrieved July 11, 2014. 1 2 "Israeli bulldozer kills American protester". CNN. March 25, 2003. Retrieved September 8, 2012. 1 2 Urquhart, Conal (April 14, 2003). "Israeli report clears troops over US death". The Guardian. Retrieved April 12, 2010. ↑ Webley, Kayla (June 4, 2010). "Who Is Rachel Corrie?". Time. Retrieved June 6, 2010. ↑ "Rachel Corrie: A worldwide symbol of the Palestinian struggle". arabnews.com. March 16, 2011. Retrieved September 8, 2012. ↑ Tarnopolsky, Noga (September 1, 2012). "Rachel Corrie's death: 'it's a no brainer that this was gross negligence'". Alaska Dispatch. Retrieved September 8, 2012. 1 2 3 "Rachel Corrie verdict highlights impunity for Israeli military". Amnesty International. August 29, 2012. Archived from the original on September 2, 2012. Retrieved September 6, 2012. 1 2 Lynfield, Ben (August 2012). "Israeli court dismisses Corrie family's lawsuit, ending effort to put army on trial (+video)". Christian Science Monitor. Retrieved 26 October 2015. 1 2 3 Hass, Amira (August 23, 2012). "U.S.: Israeli probe into Rachel Corrie's death wasn't 'credible'". Haaretz. Retrieved September 5, 2012. ↑ Pollard, Ruth (August 28, 2012). "Israeli army cleared of activist's death". The Sydney Morning Herald. Retrieved September 7, 2012. 1 2 Beaumont, Peter (February 13, 2015). "Rachel Corrie's family loses wrongful death appeal in Israel's supreme court". The Guardian. Archived from the original on February 15, 2015. ↑ Banks, Gabrielle (December 2, 2005). "Parents speaking out to keep alive memory of child killed in Gaza". Pittsburgh Post-Gazette. Archived from the original on February 4, 2006. Retrieved May 12, 2012. ↑ Tizon, Tomas Alex; Marshall, Lynn (March 18, 2003). "Activist Had Soft Spot for Underdogs". The Los Angeles Times. Retrieved December 12, 2008. 1 2 Twair, Pat; Twair, Samir (2003). "Hundreds Salute International Solidarity Movement, Rachel Corrie's Parents". Washington Report on Middle East Affairs (July/August). pp. 62–64. ISSN 8755-4917. 1 2 3 4 5 6 7 8 9 10 11 12 13 14 15 16 17 Hammer, Joshua (September–October 2003). "The Death of Rachel Corrie". Mother Jones . Archived from the original on October 1, 2017. ↑ Myre, Greg (March 17, 2003). "Israeli Army Bulldozer Kills American Protesting in Gaza". The New York Times. Retrieved September 8, 2012. 1 2 Sherwood, Harriet (August 28, 2012). "Rachel Corrie lawsuit result 'dangerous precedent' say human rights groups". The Guardian. ↑ Corrie, Rachel (February 28, 2003). "Overview of events in Gaza since Feb 14th". Palestinian Centre for Human Rights. Retrieved September 8, 2012. ↑ "'Rachel Corrie' play opens in London after NYC cancellation". CBC News. March 31, 2006. Archived from the original on June 20, 2008. Retrieved September 8, 2012. See photo of burning of mock flag attached to article. ↑ Spencer, Robert (2003). Onward Muslim Soldiers: How Jihad Still Threatens America and the West. Regnery Publishing. p. 285. ISBN 978-0-89526-100-7. ↑ "ISM Statement on the Killing of Rachel Corrie and its Aftermath" (Press release). Rachel Corrie Memorial Website. March 21, 2003. Retrieved September 9, 2012. ↑ "Rachel's War". The Guardian. March 17, 2003. Retrieved May 8, 2008. ↑ Corrie, Rachel; Rickman, Alan; Viner, Katharine (2005). My Name is Rachel Corrie: The Writings of Rachel Corrie. Nick Hern Books. ISBN 9781854599063 . Retrieved September 8, 2012. ↑ "Rachel Corrie: 'I am hungry for one good thing I can do'". Seattlepi.com. March 13, 2008. Retrieved July 28, 2010. ↑ Bromwich, David (March 16, 2009). "Thoughts on the Death of Rachel Corrie". The Huffington Post. Retrieved September 8, 2012. ↑ "Rachel Corrie death: struggle for justice culminates in Israeli court". The Guardian. August 27, 2012. Retrieved August 31, 2012. ↑ "Israel calls Corrie death 'accident'". BBC News. June 27, 2003. Retrieved September 8, 2012. 1 2 "IDF officer: U.S. activist ignored warnings before crushed by bulldozer". Haaretz. Associated Press. April 3, 2011. Retrieved September 8, 2012. 1 2 3 4 Jordan, Sandra (March 22, 2003). "Making of a martyr". The Observer. Retrieved May 8, 2008. 1 2 3 "Activists: Death was no accident; Arafat offers condolences". The Seattle Times. Associated Press. March 17, 2003. Retrieved September 8, 2012. ↑ Mackey, Robert (August 28, 2012). 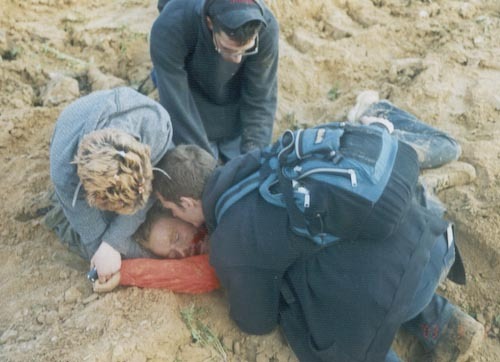 "Witness to Rachel Corrie's Death Responds to Israeli Court Ruling Absolving Soldier". The New York Times. Retrieved September 7, 2012. ↑ Sourani, Raji (June 30, 2003). "Impunity for US Peace Activist's Death". Palestinian Centre for Human Rights (PCHR). Archived from the original on September 4, 2012. Retrieved September 3, 2012. ↑ Eamonn Matthews (executive producer), Rodrigo Vazquez (director and cinematographer) (2003). Dispatches: The Killing Zone. Mentorn Midlands. Retrieved September 9, 2012. Joe (Smith) Carr's remarks occur at 9:50 into the documentary. 1 2 "Promoting Impunity: The Israeli Military's Failure to Investigate Wrongdoing". Human Rights Watch. June 22, 2005. Archived from the original on October 7, 2012. Retrieved September 8, 2012. ↑ Greg Barrett. Autopsy, military investigation differ on how activist died. Gannett News Service. June 11, 2003. 1 2 3 Blume, Howard (June 23, 2005). "Two Families' Dreams Were Not Demolished". Jewish Journal. Retrieved September 8, 2012. ↑ Corrie, Cindy (March 18, 2004). "Seeking answers from Israel". Editorial. The Boston Globe. 1 2 Bollyn, Christopher (November 27, 2003). "BBC documentary proves Israeli army murdered Rachel Corrie". Real News 24/7. Archived from the original on December 24, 2003. ↑ Sweeney, John (October 30, 2003). "Israel's Silenced Witnesses: Has the Truth Yet Been Told?". The Independent . London. Archived from the original on November 1, 2003. Retrieved May 12, 2012– via Commondreams.org. ↑ Tarnopolsky, Noga (September 1, 2012). "'Gross negligence' killed Rachel Corrie, father says". GlobalPost. Retrieved September 1, 2012. ↑ "Bill Summary & Status – 108th Congress (2003–2004) – H.CON.RES.111 – All Congressional Actions". Library of Congress. Retrieved September 8, 2012. ↑ Corrie, Cynthia (March 18, 2004). "Seeking Answers from Israel". Boston Globe. Archived from the original on July 24, 2013. Retrieved July 11, 2014. ↑ France, Louise (February 29, 2008). "She was a girl from small-town America with dreams of being a poet or a dancer. So how, at just 23, did Rachel Corrie become a Palestinian martyr?". The Guardian. London. Retrieved April 12, 2010. ↑ "Greens Call for an Investigation of the Murder of American Peace Activist Rachel Corrie by Israeli Forces" (Press release). U.S. Green Party. March 21, 2003. Archived from the original on September 19, 2012. Retrieved September 10, 2012. ↑ "Amnesty International Condemns Killing of Rachel Corrie" (Press release). Amnesty International USA. March 17, 2003. Archived from the original on November 24, 2004. ↑ Bikyamasr (August 30, 2012). "UN: Israel Corrie verdict 'defeat for justice'". Ya Libnan. Archived from the original on March 4, 2016. Retrieved September 9, 2012. ↑ "NGO Statements on the Rachel Corrie Verdict". NGO Monitor. September 10, 2012. Retrieved July 5, 2014. ↑ Jeremy Bob, Yonah (August 28, 2012). "Corrie Family: Ruling a black day for human rights". jpost.com. Retrieved September 8, 2012. ↑ "Shurat HaDin calls on Corrie Family to sue Palestinian Authority and ISM over daughter's death" (Press release). Shurat HaDin. August 29, 2012. Retrieved July 5, 2014. ↑ Burston, Bradley (March 17, 2006). "Who remembers Rachel Corrie?". Haaretz . Archived from the original on April 23, 2007. Retrieved May 12, 2012. ↑ "Ofcom broadcast bulletin Issue number 52" (PDF). Offcom. 23 January 2006. p. 4. Retrieved 26 January 2015. 1 2 Gross, Tom (October 22, 2005). "The Forgotten Rachels". The Spectator. Archived from the original on October 22, 2005. Retrieved September 8, 2012. ↑ "The Week". National Review. May 23, 2005. p. 10. ↑ Friedman, Matti (August 28, 2012). "Court dismisses damages claim in Rachel Corrie case". The Times of Israel. Retrieved July 10, 2014. ↑ Kalman, Matthew; Castle, Teresa (July 14, 2004). "S.F. Jewish activist held as security threat in Israel". San Francisco Chronicle. Retrieved August 30, 2014. ↑ Jones, Yuritzi (May 4, 2004). "Activist's parents pay tribute". Archived from the original on June 22, 2007. Retrieved December 12, 2008. 1 2 Guttman, Nathan (April 30, 2003). "'It's a terrible thing, living with the knowledge that you crushed our daughter'". Haaretz . Retrieved December 12, 2008. ↑ Teeple, Jim (January 4, 2006). "Palestinian Gunmen Attempt Gaza-Egypt Border Break". Archived from the original on December 15, 2008. 1 2 "Memorial to US activist in West Bank". USA Today. Associated Press. March 20, 2008. Retrieved December 12, 2008. ↑ France, Louise (March 2, 2008). "How did Rachel Corrie become a Palestinian martyr?". The Observer. London. Retrieved December 16, 2008. ↑ Gross, Tom (October 22, 2005). "Dead Jews Aren't News". The Spectator. Retrieved July 12, 2014. ↑ "Nonviolent protest in W Ramallah: Parents of Rachel Corrie speak, 17 injured, including journalists". Palestine News Network. March 28, 2008. Archived from the original on July 18, 2011. Retrieved January 19, 2009. ↑ Richman, Josh (June 9, 2005). "Dead activist's parents to visit Oakland". Oakland Tribune. ↑ Stratton-Coulter, Danielle (June 28, 2005). "Carrying on the fight" (PDF). The Daily Iowan . pp. 1, 7. Retrieved May 12, 2012. ↑ "Rachel's Parents Visited the Mavi Marmara". March 28, 2008. Archived from the original on April 30, 2011. ↑ "Text of opinion by United States Court of Appeals for the Ninth Circuit" (PDF). Archived from the original (PDF) on November 17, 2007. Retrieved 2007-11-17. . September 17, 2007. ↑ "Trial begins over death of US activist in Gaza". Ynetnews. Retrieved August 31, 2012. ↑ McCarthy, Rory (February 23, 2010). "Rachel Corrie's family bring civil suit over human shield's death in Gaza". The Guardian. Retrieved July 6, 2014. ↑ Sherwood, Harriet (October 21, 2010). "Rachel Corrie case: Israeli soldier in bulldozer 'did not see her'". The Guardian. Archived from the original on October 9, 2017. ↑ Sanders, Edmund (October 21, 2010). "Bulldozer driver testifies in Israeli trial over Rachel Corrie's death". Los Angeles Times. Retrieved July 6, 2014. ↑ Ben Gedalyahu, Tzvi (August 28, 2012). "Court Finds Corrie at Fault for Her Death, Exonerates IDF". Arutz Sheva . Retrieved September 9, 2012. ↑ Eldar, Akiva (February 23, 2010). "Israel grants visas to witnesses in suit over Rachel Corrie death". Haaretz. Retrieved August 28, 2012. ↑ Pleitgen, Frederik. "Israeli court: American protester Rachel Corrie's death an accident". CNN. Retrieved August 28, 2012. 1 2 Ackerman, Gwen (August 28, 2012). "Israel Court Says U.S. Activist Corrie's Death Was Accident". Bloomberg. Retrieved July 6, 2014. ↑ State Prosecutor's Office, Tel Aviv District (August 28, 2012). "Statement regarding civil suit in the matter of Rachel Corrie" (Press release). Israel Ministry of Foreign Affairs. Retrieved October 25, 2017. ↑ "The Guardian's Rachel Corrie obsession". CiF Watch. August 29, 2012. Retrieved July 6, 2014. ↑ Sabel, Robbie (August 31, 2012). "ISM was using activists as terrorists' human shields". Jewish Chronicle. ↑ Bob, Yonah Jeremy (August 28, 2012). "Haifa court rules against Rachel Corrie family in suit". The Jerusalem Post. Retrieved August 28, 2012. ↑ Raved, Ahiya (August 28, 2012). "Court rejects Corrie family civil suit". Ynetnews. Reuters. Retrieved August 28, 2012. ↑ Musleh, Maath (August 29, 2012). "On the receiving end of Israeli 'impunity'". Al Jazeera. Retrieved July 6, 2014. ↑ "Israel rules activist's death 'an accident'". Al Jazeera. August 28, 2012. Retrieved July 6, 2014. ↑ "UN human rights expert speaks out on Israeli ruling on Rachel Corrie verdict". The United Nations. August 30, 2012. Retrieved September 1, 2012. ↑ "Jimmy Carter calls Rachel Corrie case ruling 'unacceptable'". The Jewish Journal of Greater Los Angeles. August 30, 2012. Retrieved September 1, 2012. ↑ Bob, Yonah Jeremy (21 May 2014). 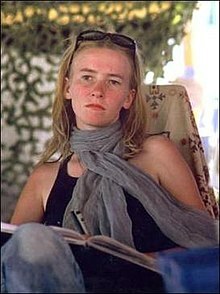 "Supreme Court hears culmination of lawsuit over death of Gaza protester Rachel Corrie". Jerusalem Post. Retrieved 26 January 2015. ↑ Lynfield, Ben (19 May 2014). "Rachel Corrie death: Activist's family launch final bid to secure 'justice' from Israel over 2003 bulldozer death". The Independent. Retrieved 26 January 2015. ↑ Beaumont, Peter (19 May 2014). "Rachel Corrie's family to have case reheard in Israeli supreme court". The Guardian. Retrieved 26 January 2015. ↑ Gallagher, Katherine (21 May 2014). "The Israeli Court System on Trial: The Rachel Corrie Appeal". The World Post. Huffington Post. Retrieved 26 January 2015. ↑ Schwartz, Michael; Ford, Dana (February 12, 2015). "Israeli Supreme Court rejects appeal in Rachel Corrie case". Archived from the original on February 16, 2015. ↑ "Occupation forces open fire on foreign peace activists". As-Safir . Translated from the Arabic by Eric Mueller. March 19, 2003. Retrieved July 12, 2014– via Action Report. ↑ Murray, Gordon (April 3, 2006). "I am Rachel Corrie". Seven Oaks Magazine. Archived from the original on November 18, 2008. Retrieved December 12, 2008. ↑ "Tehran street named after American activist". The Independent. Press Association. August 11, 2011. Retrieved August 12, 2011. ↑ "Iran names street after Rachel Corrie". The Guardian . August 11, 2011. Retrieved August 13, 2011. ↑ Coyne, Amanda (April 22, 2004). "Cover story". The Anchorage Press . [ dead link ] See search [ permanent dead link ] for abstract. ↑ Bryson, George (April 25, 2004). "Flashpoint Cantata". Anchorage Daily News . Archived from the original on September 20, 2008. Retrieved May 12, 2012. ↑ "The Review". Camden New Journal. New Journal Enterprises. October 28, 2005. Retrieved January 7, 2009. ↑ Weiss, Philip (April 3, 2006). "Too Hot for New York". The Nation . ISSN 0027-8378 . Retrieved May 13, 2012. ↑ Davis, Walter A. (March 6, 2006). "The Play's the Thing". Counterpunch. Retrieved September 2, 2012. ↑ Simonson, Robert (October 5, 2006). "My Name Is Rachel Corrie Begins New York Debut Off-Broadway Oct. 5". Playbill. Archived from the original on October 24, 2012. Retrieved September 8, 2012. ↑ Dave (February 22, 2008). "International productions of the Play". Rachel Corrie Foundation for Peace & Justice. Retrieved September 8, 2012. ↑ "Suas Síos". AllMusic Guide. Retrieved 18 October 2017. ↑ Woodward, Heather (September 27, 2003). "Film on Rachel Corrie in the works". The Olympian . The Evergreen State College. Retrieved May 12, 2012. • Sweeney, John (November 6, 2003). "Quest for truth over Gaza death". BBC News. London. Retrieved May 12, 2012. ↑ "What we can do". rachelcorrie.org. Archived from the original on April 17, 2003. Retrieved September 9, 2012. ↑ Nettnin, Sonia. "Film Review Rachel Corrie – An American Conscience". Scoop. Retrieved May 12, 2012. ↑ Horton, Matt (July 2005). "'My Name is Rachel Corrie'". Washington Report. pp. 80–83. Retrieved September 8, 2012. ↑ Twair, Pat; Twair, Samir (2005). "New Film on Rachel Corrie". Washington Report on Middle East Affairs (May/June): 46–49. ISSN 8755-4917 . Retrieved May 12, 2012. ↑ O'Hehir, Andrew (May 3, 2009). "Rorschach "Rachel"". Salon . Retrieved May 4, 2009. ↑ Houpt, Simon (May 4, 2009). "The 23-year-old activist who became a lightning rod". The Globe and Mail . Archived from the original on May 5, 2009. Retrieved May 4, 2009. ↑ Laub, Karin (June 5, 2010). "Israel remains defiant, seizes Gaza-bound aid ship". Associated Press. Archived from the original on June 8, 2010. Retrieved June 5, 2010. ↑ Bronner, Ethan (June 5, 2010). "Israeli Military Boards Gaza Aid Ship". The New York Times. Retrieved May 12, 2012. ↑ "The unveiling of the gravestone of American martyr in the Tehran cemetery (رونمایی از سنگ قبر شهید آمریکایی در بهشت زهرای تهران)". Mashregh news. Retrieved 18 March 2015. Sandercock, Josie; Blincoe, Nicholas; Sainath, Radhika; McLaughlin, Marissa; Khalili, Hussein; Arraf, Huwaida; Andoni, Ghassan (2004). Peace under fire: Israel/Palestine and the International Solidarity Movement. Foreword Said, Edward W. London: Verso Books. ISBN 978-1-84467-501-2. Herzberg, Anne (August 28, 2012). "The Corrie case: Reckless choices". Opinion. The Jerusalem Post. Retrieved August 28, 2012. Wikimedia Commons has media related to Rachel Corrie .